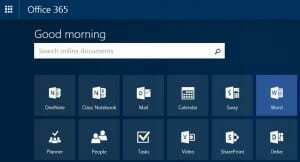 If you still wish to use MS Word on Office 365 then you could still create a bibliography from Refworks but you would need to copy and paste the final bibliography into your Office 365 Word document. Step 1. To add references to the new Library system it is best to log into Refworks first. Step 2: Elect a separate tab and open the Library website then run a keyword search such as ‘change counselling’. 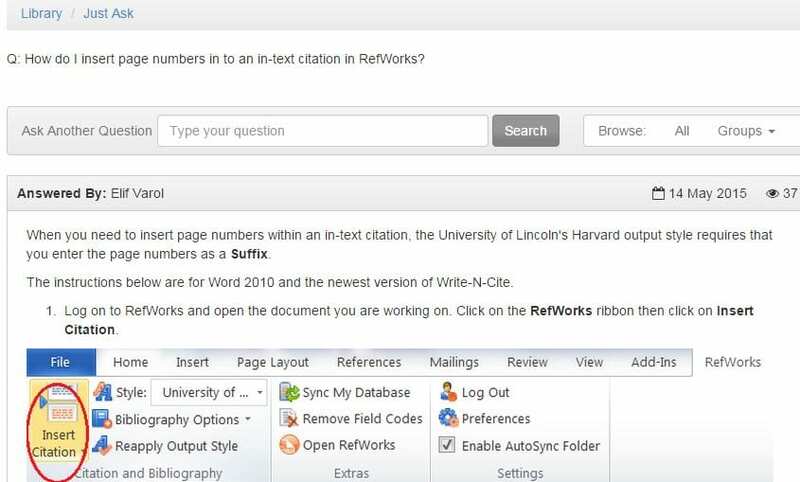 For anyone interested in using Refworks, the referencing software, you may be wondering about where to download some helpguides, or receive a paper mountain of step-by-step how to guides. In the interests of the environment (last month was the hottest April on record) I thought it was a good idea to highlight where to find even better help if you have any questions (you can, of course, email refworks@lincoln.ac.uk). 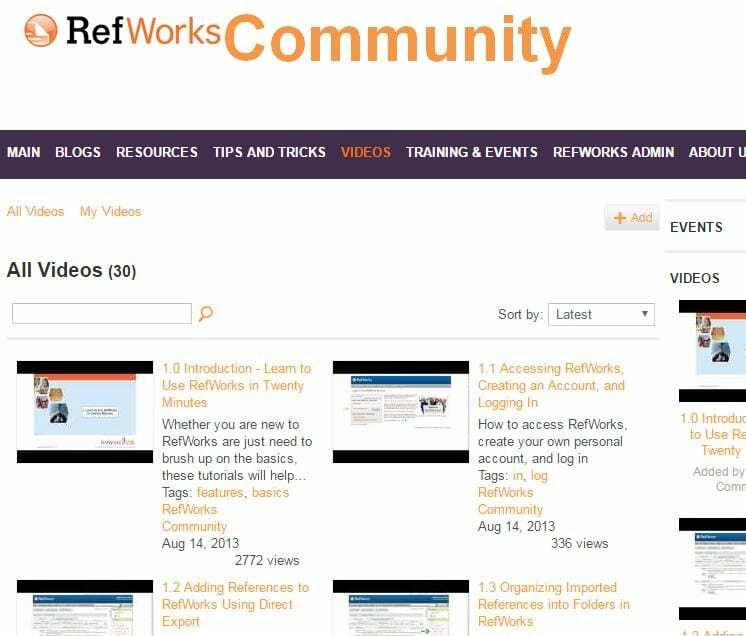 On the Refworks webpage (library.lincoln.ac.uk > resources > Refworks) at the top right-hand corner of the screen you will find a link to the Refworks Community, ideal for the inquisitive reference organiser where an assortment of videos is stored. I’m running a Refworks session for the Academic Subject Librarian for Psychology, Oonagh Monaghan, on Monday so I’ve embedded this PowerPoint presentation in advance. As an introductory overview about the main features of Refworks, albeit using the APA referencing system, rather the the Lincoln International Business School’s chosen Harvard referencing style, I hope it will help those interested in exploiting this labour-saving device. This is our 200th post on the Business Librarian blog! By way of commemorating this major milestone I have decided to announce that I’ve just attended some further EndNote training, which is referencing software generally used by, although not exclusively, postgraduates and academics. At first it can be hard learning something as multi-layered as EndNote. Learning Refworks for instance, another referencing software package we subscribe to, took a little while to fully understand. Only when producing lesson plans and responding to student queries did the referencing penny finally drop and I was able to master Refworks. Following an instructor is worthwhile, but it doesn’t match a practical (let’s say problem-solving)) approach of dealing with obstacles, because making mistakes is important. Indeed there is almost entire discipline on making mistakes and it is recognised by theorists that mistakes are an integral part of the learning process and a key component in assembling self-reflective values. Why not check out Rolková & Janošková’s (2014) Employee mistakes as a necessary way of learning in companies in Proceedings of the Multidisciplinary Academic Conference if you are interested in the scholarly literature out there? I digress. 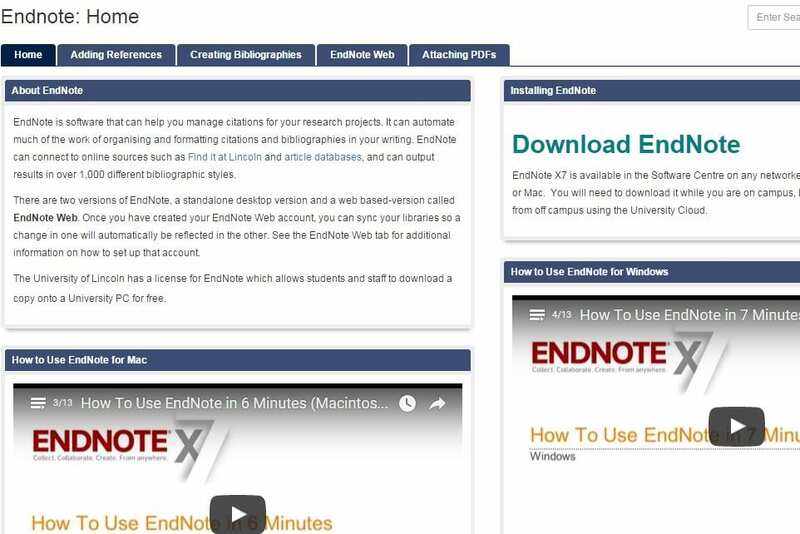 Fortunately our esteemed colleague, the Academic Subject Librarian for Journalism is currently producing a guide and EndNote does own a YouTube account which holds many helpful online tutorials, one of which is a 25-minute starter called ‘EndNote on Windows’. Whenever we run one of our Library workshops on the referencing software Refworks we always need to remember to answer the ubiquitous question ‘How do I insert page numbers within Refworks?’. Fortunately, this is precisely what Elif Varol (Electronic Resources Library Assistant) has done as part of our Just Ask facility where students ask any question to the Library team – for the answer see below for a series of step-by-step screenshots. Also, why not check out Elif’s informative Thought Cloud blog at: http://elif.blogs.lincoln.ac.uk/. Further to enquiries about getting the RefWorks catalogue search working again, our esteemed colleague Elif Varol has written an excellent step-by-step guide, with screenshots, on using the catalogue search. 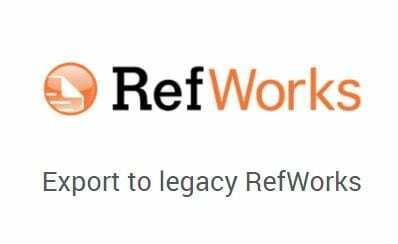 If you would like help with Refworks please email us at businesslibrarian@lincoln.ac.uk and we’ll be happy to help. It’s easier than you may think!